Scarlet Rhapsody > Con Reports > [Hydra Comic Con 2017] I Got the Hook Up! Hydra Comic Con took place on June 17-18, 2017 at the Santa Clara Convention Center in Santa Clara, CA. 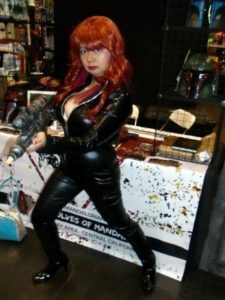 Not too far from Great America and a stone’s throw away from San Jose’s Mineta airport, Hydra Comic Con is a first year event ran by the same staff that ran Kraken Con, another pop culture themed event in the Bay Area. Hydra Comic Con was a very small event at the far corner of the Santa Clara Convention Center with a workshop room, two panel rooms, main events hall, and an exhibit hall. Guests included Svetlana Chmakova, Danny Bulandi, Pamela Lovas, Derek Fridolfs, etc from the comics side and Rob Paulsen, Catherine Taber, Keith Silverstein, etc from the voice acting side. 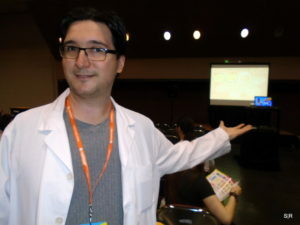 The first year brought in guests from the industry and the creator side. 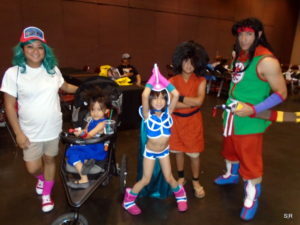 Hydra Comic Con’s greatest strength is that it is an all ages family friendly event. We did see a lot of families attend this event all in cosplay or just one generation of geek passing onto the next generation of geek. 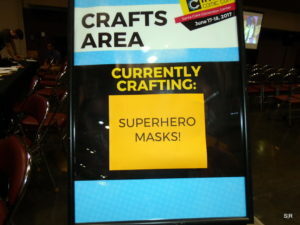 There were a lot of things for kids to do such as crafting, bounce house (who needs a ball pit), and lots of opportunities to interact with artists, creators, and voice actors. There was hardly any lines for any of the guests. Most guests were available for chi chatting and autographs. You could go home happy with signed materials. Events ran until 5PM in the evening encouraging people to take advantage of Hydra Comic Con’s offerings during the day. The exhibit hall was where most of the action was going down. This is where you can craft, play console games, play Rock Band with friends, shop around, and watch subtitled anime (as provided by Crunchyroll). You could also get a free photoshoot in the exhibit hall as well. Photos would be available on the Hydra Comic Con Facebook page within a few weeks after the con. Dealers ranged from the usual anime booths that sold anime figures and cosplay accessories. Comic book booths sold nostalgic collectors toys and figures. 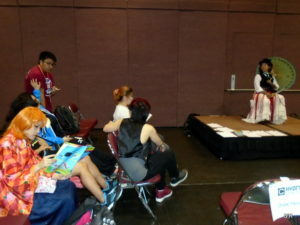 The event did have plenty of panels varying from cosplay workshops and how-to as well as interactive experiences with the guests of the con. We did about five panels for Hydra Comic Con; audiences were small, but we’re happy to talk about pop culture topics even if there’s one person in the audience. Sunday was the lightest day and we had few people in the audience for each one we ran. Guest panels took up main events. There were even some stand up comedy type of performances throughout Hydra Comic Con. Though we were busy running panels, we would have loved to have seen cerebral centered panels such as anthropology of X-men. There were interesting topics worth checking out. 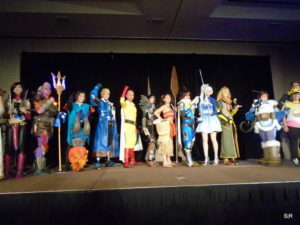 The biggest event was the cosplay contest on Saturday. This was the main event. Hydra Comic Con was a few weeks after Fanime Con, the largest event in the San Francisco Bay Area. 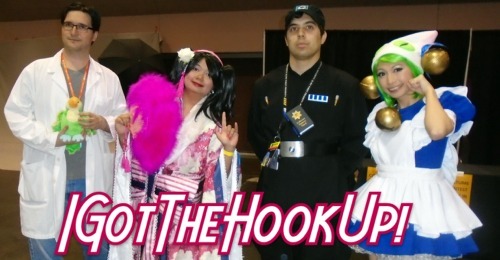 For a small con, we saw plenty of quality cosplayers throw their hat in the ring. There about 20 or so entries. All entrants were very impressive. 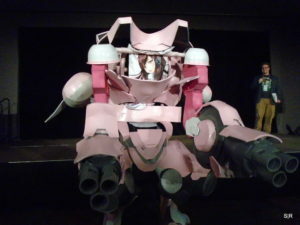 The show was judged by veteran cosplayers, Cherry Tea Girl and Yukari Kaiba. The show was a standard walk on of sorts where cosplayers did three poses on stage while the MC asked the cosplayers a few questions where they answered in character. A majority of the costumes entered in had some sort of highly detailed accessory whether if it was a weapon piece or replica vehicle. I was thoroughly amazed by all of the entries by their craftsmanship and stage presence. Usually small cons have a hard time engaging people to enter the contest. This one had very solid contestants. It was very inspiring to see everyone’s work up close from the front row. The grand prize for best in show went to Miaka No Baka who entered as Mei from Overwatch. However, I don’t normally use the phrase “everyone is a winner.” This contest is an exception to the rule. The con culture of Hydra Comic Con is very laid back – even if there are Imperial officers patrolling the exhibit hall. People were generally friendly. A majority of the attendees were commuters local to the area that had a free weekend between Fanime and Anime Expo. A lot of them were from the anime and gaming crowd than the comic / pop culture crowd. I saw a lot of Love Live, Overwatch, and League of Legends cosplayers on both days. As mentioned before, there were a lot of families attending – two generations of nerd culture present. People were generally friendly to talk to and to strike conversation with. Even guests were very interested in chit chatting with attendees by being the first to initiate a conversation. Keith Silverstein actually approached Jared when he was wearing his Imperial Officer bound. Silverstein, also the voice of Professor Tomoe (Sailor Moon), and Jared just started talking about radio. The Mandolorian Mercs were also interested in recruiting us to be a part of their costuming group. Hydra Comic Con really does have a community feel to it. A small group of people, but we’re all nerds of a feather. Overall, Hydra Comic Con is a nice locals event for the South Bay. Since Wonder Con has departed the Bay Area, other pop culture themed events are looking to replace that void. Hydra Comic Con has a staff that knows what they’re doing – everything seemed to run smooth and staff was very friendly and attended to issues. Staff even took care of a creepy person situation on day one swiftly without drama or causing a scene. The timing of Hydra Comic Con is tricky, but the June dates, at least from what I’ve heard, had more to do of what was available for the venue. 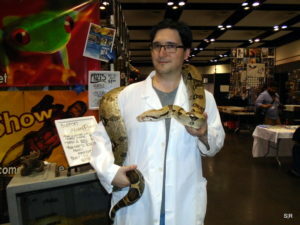 Hydra Comic Con has potential of being the Bay Area’s next big pop culture event. However, mid-June gets really tricky because of the timing of post-Fanime recovery and pre-Anime Expo preparation and budgeting. As a local event, it seems to fare well. We hope to see Hydra Comic Con in the future. Until then, it’s always a pleasure running panels for this dedicated nerd herd!